The row between SriLankan Airlines’ management and its Pilots Guild continues. SriLankan Chairman Ajith Dias has told the Guild that its members will face “disciplinary” action if they resorted to “any form of industrial action.” He claimed that a Collective Agreement between the management and the Guild signed on September 12 2014 forbade such activity. In a three-page letter he has quoted different clauses from the agreement to back his claim but the assertions are being challenged by the Guild. The tough line of the management came despite the Guild winning relief on a complaint lodged with the Labour Department over the denial to pilots of the use of the Business Class lounge. After an inquiry, Additional Labour Commissioner P.A.S.C. Pathiraja has ruled that the pilots should be allowed the use of this facility. In the light of ongoing repairs to the runway at the Bandaranaike International Airport (BIA), the Additional Labour Commissioner has said that steps should be taken to allow the pilots to use the Business Class Lounge after April 7. His ruling has been copied to the SriLankan Chairman. The Guild has charged that the Chairman and the “higher management” have throughout the discussions they had, sought to “down play the issues” they have raised. Two such issues, it has pointed out, were the denial of their annual leave and the right to use the Business Class lounge by members who hold tickets. It has added that “we are well acquainted with the provisions of our Collective Agreement as well as the People Administration and Engagement Policy manual copiously reproduced” by the Chairman in his letter. A Bank that sits above other banks is to make a decision next month over a bid a new entrepreneur is making to take control of a business conglomerate. The going price, they say, is Rs. 15 billion inclusive of a media arm. With a five billion loan from a state bank, five billion more by divesting his assets and the balance from the bigger bank, he wants to close the deal. It’s no laughing matter, they say. That man Sri Lankan politicians stick strictly to astrological advice is well known. 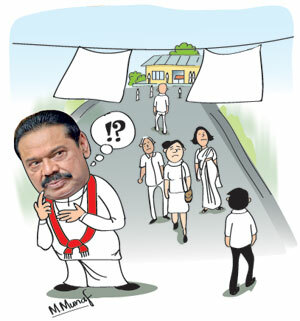 This week, former President Mahinda Rajapaksa turned up at a funeral house of a close relative of a Pradeshiya Sabha member in Kandana. Waiting outside the house, he sent for the member to come out. He then explained that he was wearing a talisman (surey) and was therefore unable to come inside where the body lay. The member accepted his condolences and directed his supporters to take Mr. Rajapaksa to the adjoining house. There he was served tea before leaving. Decades ago, when the late Sirimavo Bandaranaike was the Prime Minister, a high powered delegation from Japan’s Fuji Steel Corporation was visiting Sri Lanka. It was headed by its Chairman Shigeo Nagano. It was a time when Ms Bandaranaike was advised by her astrologers not to venture out of the house. So the task fell on her number two then, Maithripala Senanayake, to meet the delegation for talks. Five men, including an officer, from the Army’s Directorate of Military Intelligence, who were arrested in connection with the abduction and alleged torture of journalist Keith Noyahr, were re-remanded till March 16. The men whom CID detectives say are members of a so-called “white van squad” were produced before Mount Lavinia Additional Magistrate Lochana Abeywickrema last Friday. Those remanded were Major Prabath Bulathwatte, Warrant Officer Lasantha Wimalaweera, Sergeant Duminda Weeraratne, Sergeant Hemachandra Perera and Corporal Nishantha Jayatilleke. Counsel Ajith Pathirana who appeared for Sergeants Perera and Weeraratne said that the file on Keith Noyahr’s alleged abduction had been closed in 2010. He wanted to know on whose authority it had now been re-opened. Criminal Investigation Department (CID) Inspector Nishantha Silva told Court that Major Bulathwatte and his team were the main suspects in the killing of Lasantha Wickremetunga, Editor of The Sunday Leader. Detectives investigating that killing have uncovered evidence of Major Bulathwatte and his team’s alleged involvement in the abduction and alleged torture of Mr. Noyahr, he said. He also said that the files on Mr Noyahr’s case were among those transferred from the CID to the Terrorism Investigation Division (TID). Inspector Silva said he had personally briefed the Magistrate in December last year before obtaining permission to travel to Australia to record Mr. Noyahr’s statement. The Court has already directed Mr. Noyahr, to be present to identify the suspects. The arrival in Colombo of International Monetary Fund head Christine Lagarde has been delayed, a Finance Ministry source said yesterday. The source said she is stopping over in Colombo en route to the Indonesian capital of Jakarta. “We have been told of a tentative date, March 22 but we are awaiting confirmation,” the source added. Twenty MPs went for the meeting with IMF representative Eteri Kvintradze. However, only three were permitted to enter in view of space constraints. Besides Mr. Gunawardena, the others were Bandula Gunawardena and Shehan Semasinghe (Anuradhapura District MP). Earlier, the 20-member delegation called on Central Bank Governor Indrajit Coomaraswamy for a lengthy discussion. Among the issues discussed was the issue of bonds by the Central Bank.